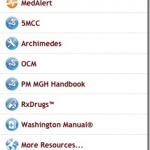 Pocket Medicine App Review for Android – Will it replace your “red book”? A look into the famous “red book” carried by medical students and internal medicine residents – Can the medical app on the android replace the famous text? We review this classic pocket reference text, now in iPhone form. Its definitely got all the detail and brevity that makes the pocket version great. But is it a great app?